Since butchering 8 ducks two weeks ago, I’ve been able to explore more duck dishes, certainly, finding the best and most convenient way of cooking duck. Since being busy with sow Number 1 and her piglets, I don’t really have the time to prepare and cook complicated duck dishes. 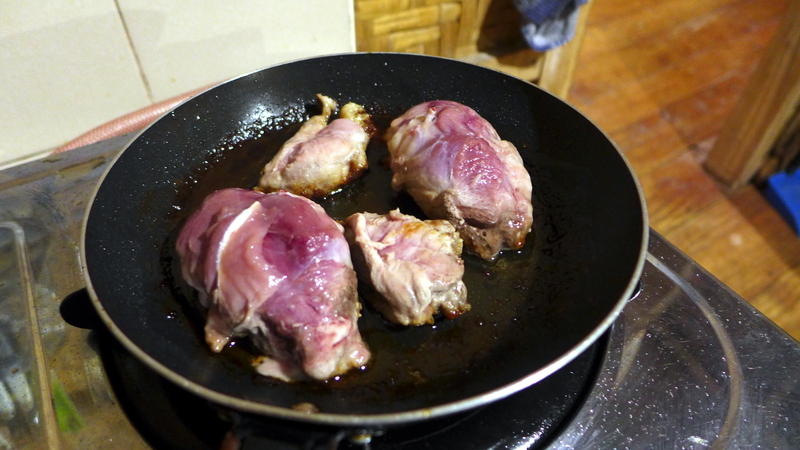 The most convenient way to keep duck is by cooking and preserving it in oil. The French call it “confit.” Here, the duck fat is rendered and this fat is used to cook and preserve the duck. If not enough fat is produced, it is acceptable to use suitable cooking oil. The process of making duck confit involves salting the duck with salt and a variety of herbs, keeping that overnight or so, then cooking in oil. In my case, not having the leisure of such preparations, I simply cut up the duck and put it in a pot of coconut oil. A small amount of aromatic herb is placed in the oil — some thyme, star anise and a bit of laurel leaf. A bit of salt and pepper. And that’s it — the pot is heated up every now and then over the next couple of weeks, adding new duck in as the pot is emptied, keeping the oil and adding extra oil if necessary. 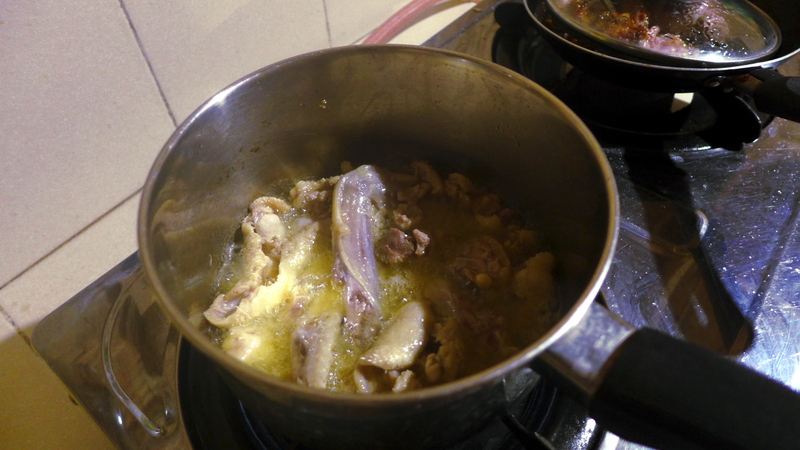 The best thing about this method is that you can take out a bit of duck meat and prepare that in any way you wish. Because the duck has been cooked in oil until tender, it doesn’t take much time to whip out a duck dish. Some of the dishes I’ve prepared are these (see photos). The easiest is to get some duck legs or breast and braise that in oil, tomatoes, salt and pepper, or some kashmir chilies. I have also made duck stew with vegetables which has a brown duck sauce base and some potatoes and carrots. 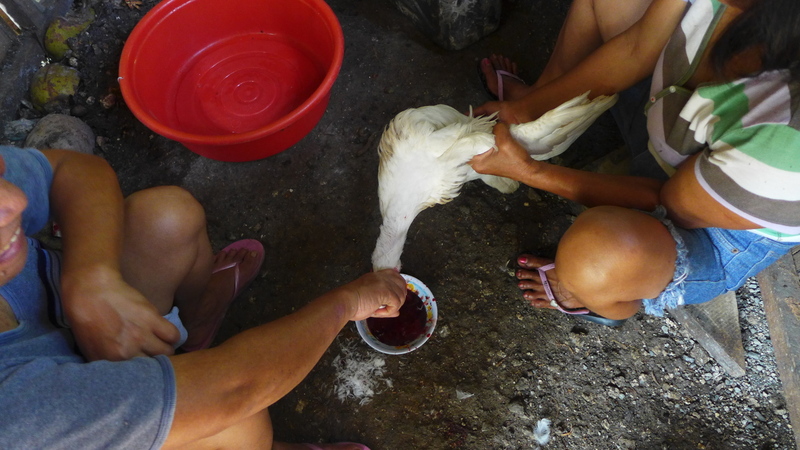 Here, the duck meat can be shreds of meat off the backbone, wings and neck. One of my favourite experiments is “corned duck.” I love corned beef and I really just had to create that same taste and texture with duck meat. I selected duck breast now truly tender from cooking in oil. This meat is flaked and set aside. Next is chop up some onions which will be browned in oil to caramelise. You can add garlic here if you wish. 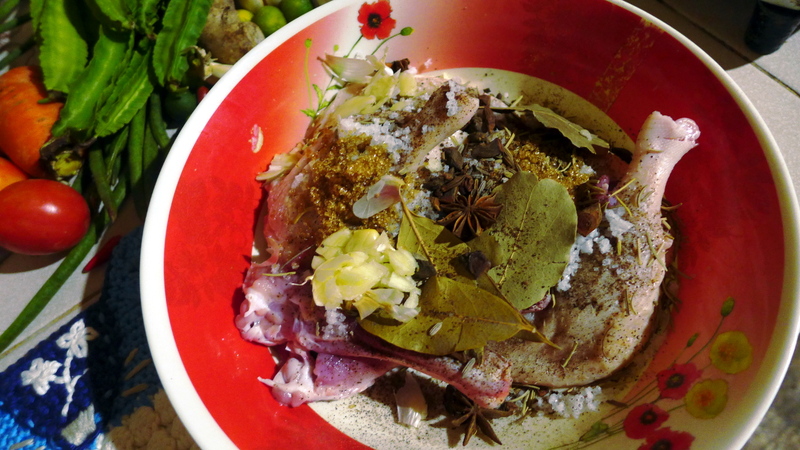 Next, the shredded duck breast is added together with salt, pepper, a bit of sage, a bit of allspice powder and star anise. The result is absolutely fantastic. 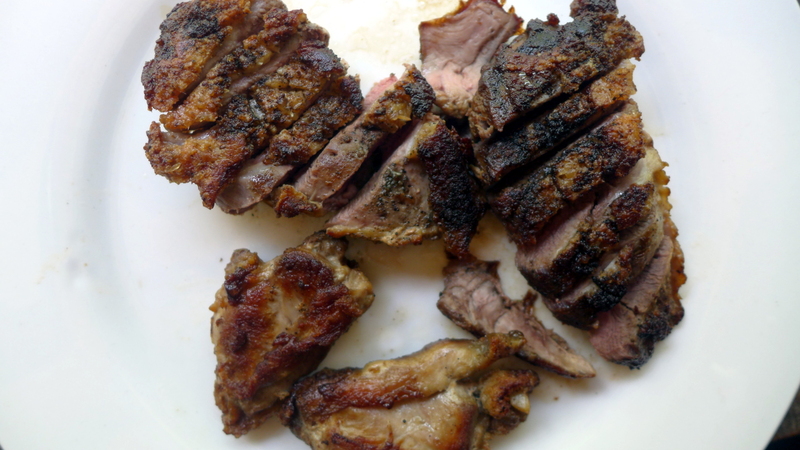 Duck meat resembles beef and using shredded duck meat with spices commonly used in corned beef or salted beef preparations produce such a remarkable dish. I love the long shreds of duck meat! I only regret that I didn’t have enough duck fat to add to this! Other ways of cooking duck I’ve tried are: duck curry, duck noodle soup and duck spring rolls. All coming from a pot of duck confit! So there — over the last 2 weeks we’ve cooked and consumed 4 ducks and served guests as well. We still have 4 more ducks to go and I don’t get tired of eating duck because it can be prepared in a variety of ways. Bon appétit! Posted on January 17, 2016 October 30, 2018 Categories The DuckeryTags barbary duck, duck breasts, duck confit, duck legs, duck recipes, garden vegetables2 Comments on Linggo ng Pato! We had two ducks slaughtered yesterday afternoon and I finally came up with something new, something absolutely fantastic with this extraordinary meat. I started by butchering the whole duck, separating legs, wings and breasts. It is not difficult at all, it is much like butchering a chicken. I’ll post something about that next time. How Much Did the Ducks Weigh? Before butchering, the ducks weighed 1.65 and 1.4 kilos. After dressing, the carcass (with heart and liver) weighed 1.45 and 1.2 kilos. Both ducks were about 4 months old. We’re trying to feed the ducks better so as to get more meat before they get to 6 months. I would personally like to be able to have barbary ducks of about 2 kilos dressed weight. How Do You Butcher a Duck and What Do You Do With It? Although you can cook a whole duck – baked or braised – you can cut it up and use when needed. Today, I cut up the legs for use in confit. The leg pieces are salted and spiced, then placed in the refrigerator for no less then 36 hours. Later, these duck legs will be cooked slowly in duck fat until the meat falls off the bone. Duck legs salted and spiced for confit. The fat and skin are trimmed off the duck and rendered – that is, heated slowly until all the fat has melted into oil. This rendered duck fat is phenomenal in French cuisine. This is the fat that I will be using later for the confit. Rendering duck fats (trims of fat, skin, wings, neck etc) to collect the oil. The breasts (in halves) are salted and peppered on the skin side (skin sliced first to let the fat through when cooking). Don’t salt the meat side because this will dehydrate the meat and make it tough. Cook skin down, don’t use any oil because the duck fat will melt and it will be enough to cook the duck skin crisp. The duck bones (head, feet, wings, backbones etc) will be used later to make delicious stock or brown sauce. More about those in the next posts! Note: I prepared all this in the evening because the ducks were butchered late in the afternoon and I didn’t want to freeze them before using. This way, the ducks are prepared fresh. Then I stored the duck legs in a sealed container and put it in the refrigerator, together with the seared duck breasts. The duck breasts will be prepared the next day for lunch. The seared duck breasts could be used right away – it can be grilled and cut up. However, today, I decided to fry it up, again with no additional oil – and no additional salt. I cooked it on the meat side using a non-stick pan. More duck fat oozed while cooking. Cooking doesn’t take long, maybe about 5 minutes on this side. Then I turned it over on the skin side again and cooked for about 3 minutes. What we mustn’t do is overcook the meat otherwise it will become dry and tough. Aim for medium rare meat. To go with the duck breasts I decided on rotis and curry sauce. I made the rotis using flour, water and salt, and a small amount of oil, cooked in a non-stick pan on one side, then turn the other side directly over the fire. Cooking is about a minute on each side. 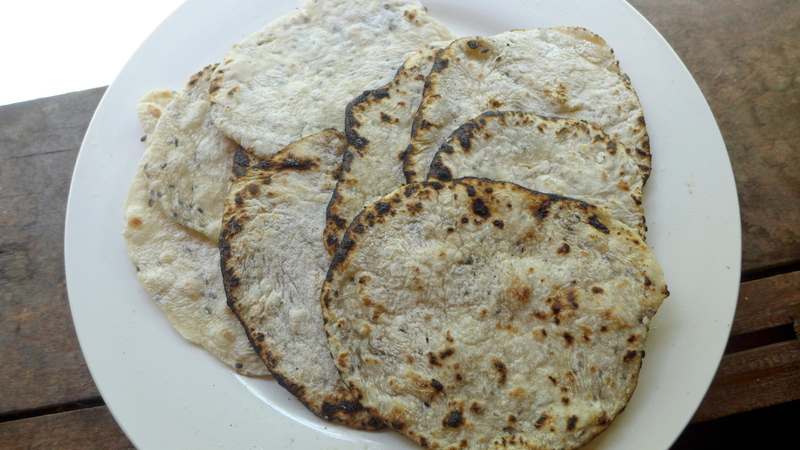 My rotis have black sesame seeds, and I love these! 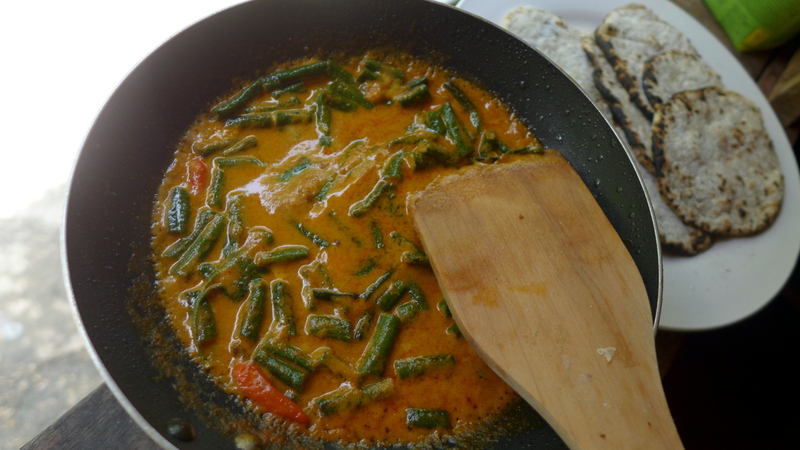 The curry sauce is prepared Thai red curry with lots of coconut milk and sliced string beans, and two red chilli. I used the same pan used to cook the duck breasts so as not to waste that fantastic fat and flavour. 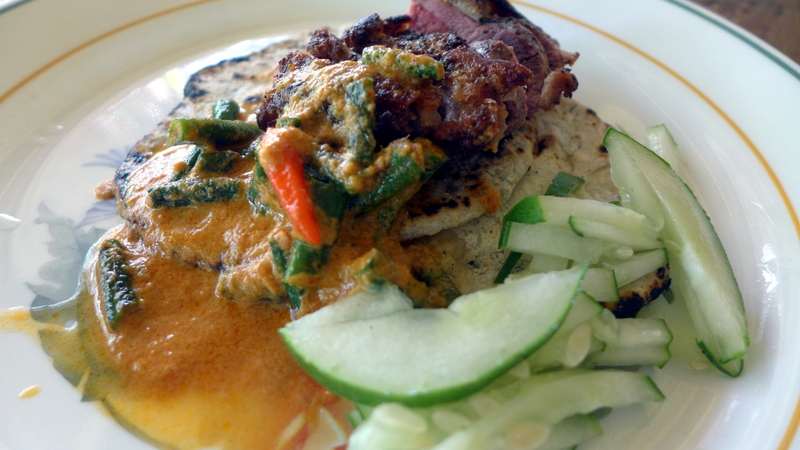 Putting it all together – two pieces of roti, sliced duck breast on top, curry sauce around it and some sliced cucumbers. Absolutely fantastic. 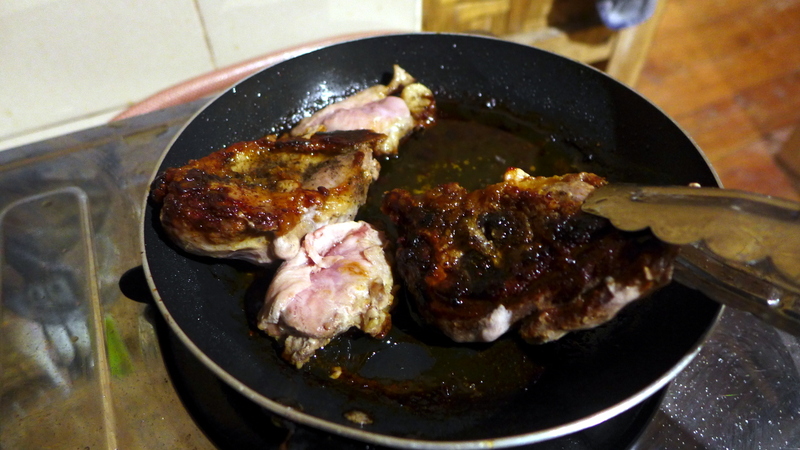 The taste of duck meat is indeed amazing, and the fat (which is considered not as unhealthy as beef or pork fat!) exudes this extraordinary rich aroma. I personally don’t find duck meat gamey at all perhaps because I am very fond of beef, especially served medium to rare. There’ll be more recipe experiments to come with this fantastic meat! Bon appétit! There were some duck breast and rotis leftover. 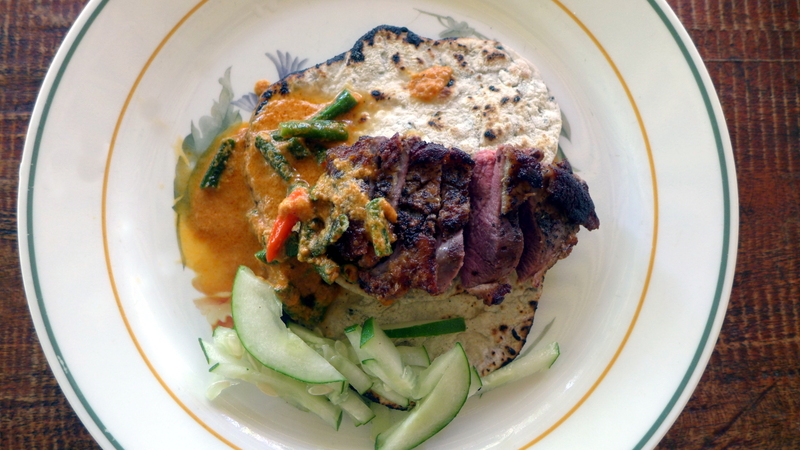 So I cut of the duck breast into small strips, intending to wrap them in the roti. But I couldn’t wrap up the duck slices in the roti, because the rotis were too small. 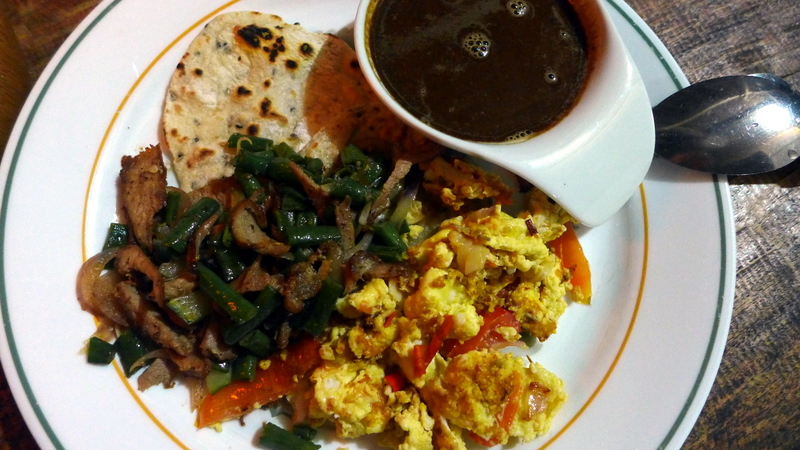 So I decided to cook the duck breast slices with some string beans, onions, tomatoes, make some scrambled duck eggs with garlic, tomatoes and rosemary, served on top of the rotis and with some sate sauce on the side (sate sauce goes very well with duck!) Dinner solved! Thanks to the ducks! 😉 Confit will be for tomorrow!